Hurry! Check-out TTi’s run-out stock this season! Tray Mount Fire-Fighting and Field Sprayer Units! 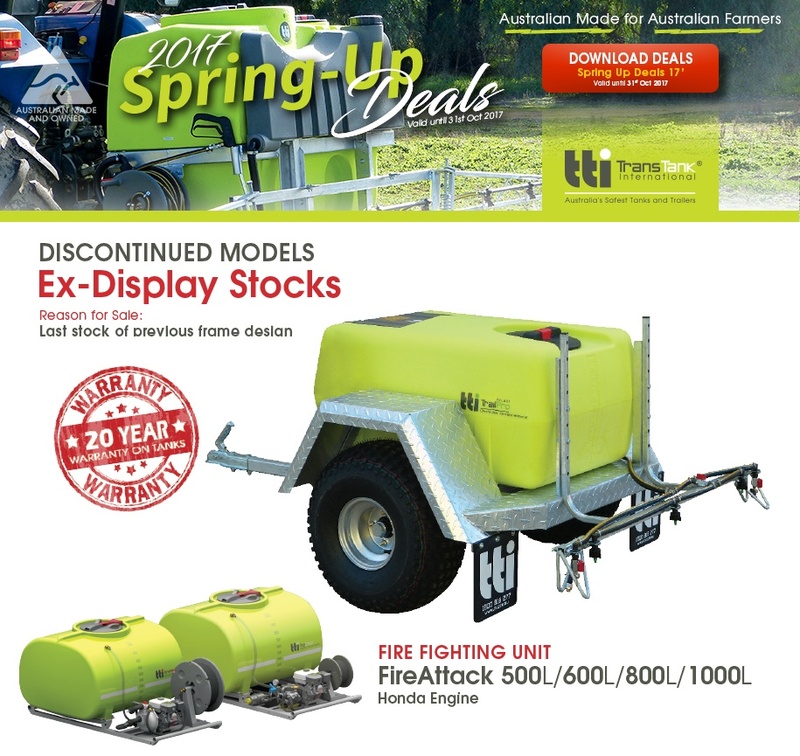 As the company introduces new frame designs for firefighting, field sprayer and trailer sprayer units, TTi is now offering the last stock of previous frame models at lowest prices! The TTi Spring-Up Deals ’17, valid until October 31, 2017 offers discounter prices for Ex-Display Stocks. Fire Attack with Honda Engine ranging from $3,749 to $4,176, depending on the tank size (500L, 600L, 800L, 1000L). Only 10 Units available so secure your unit today! TopCrop field sprayer unit, with Honda Engine and 34L/min Italian pump, prices ranging from $3, 975 to $4,506. Only 9 units available so quickly secure your unit today! TrailPro 200L with 12v 60psi Delavan pump, 6m hose and gun, valued at $2,878 per unit. Save over $700! Quickly secure your unit today! Visit www.tti.com.au for more information or call 1800 816 277!